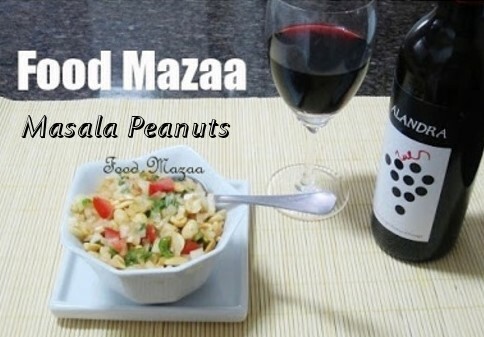 Crunchy and tangy masala peanuts make a great accompaniment to the drinks. This is very popular in most of the clubs like Gymkhana and Golf Club..You have to make them just before serving to keep the peanuts crunchy..
1. Cut the onion, green chillies, coriander leaves very finely. 2. Remove the seeds from the tomato and cut it very finely. Select a firm tomato, not a soft and mushy one. 3. Mix all the ingredients and season with salt, red chilli powder and lemon juice. Interesting snack, I make similar to this with boiled groundnuts. Ok.. will try that too..
Love this idea a lot. Thanks this will feature in the next party for sure. Oh gr8.. perfect for a party. Perfect snack with Mocktail and Cocktail !!! Interesting masala peanuts. Simple but amazing! Excellent snacks, love to finish that whole bowl. this is a perfect party food, Shobha ji..love the addition of tomatoes there, very unique. This is certainly an interesting sounding snack! This snack looks perfect . Add the masala gives them a wonderful spicy kick. Such a delicious snack. I love peanuts and can finish it in no time! Same here Jyoti.. they are so addictive.